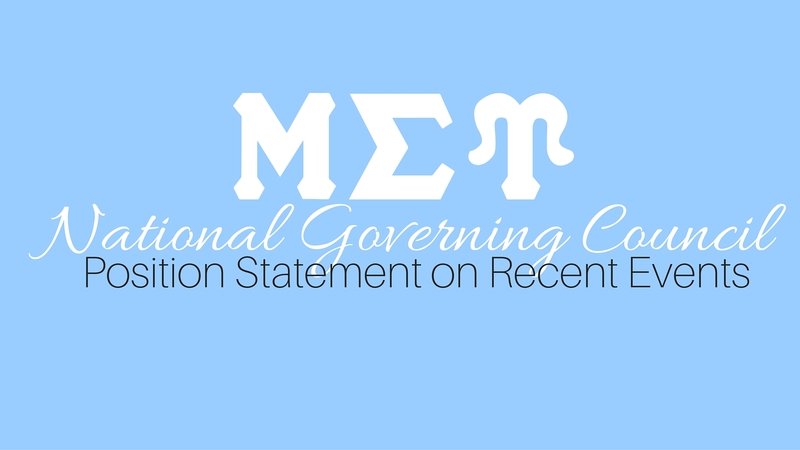 NGC Position Statement on Recent Events | Mu Sigma Upsilon Sorority, Inc. 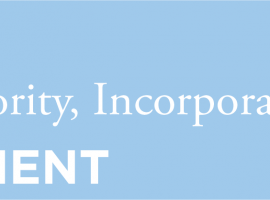 Your National Governing Council would like to address recent events with you to let you know where we stand as an organization. We are living in trying times. Mass killings in nightclubs. A seeming rash of police killings of black civilians. A resulting rise in violence against police. It’s all quite frightening and disheartening. It’s enough to make us want to close our eyes and wish it all away. However, we can’t. Unfortunately, this is the reality of our country and our world. Nevertheless, there are good realities in our world too. We need to focus on these and perpetuate these. For instance, It is a reality that LBGTQ Lives Matter. It’s a reality that Black Lives Matter. It’s a reality that Blue Live Matter. It’s a reality that Military Lives Matter. All of these are true. One does not negate the other. One does not take away from the other. To support black lives does not mean you’re automatically anti-police, and vice versa. This is the stance of our organization. As we are diverse, we respect diverse views. When our black sisters cry, we hold them tightly and we all work side by side to make things better. When sisters serve in law enforcement, we’re proud, and hold our heads high. 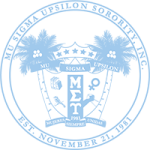 Mu Sigma Upsilon is the bastion – we are what the rest of the world is trying to look like. What an awesome responsibility we have. Now, we all know discrimination personally. As women, we’re paid lower salaries for the same work and lack a political voice. We also know how one bad apple can spoil the whole bunch all too well… how one black person can do something wrong and suddenly all black people are stereotyped. How a handful of police officers can wrongfully take lives, but suddenly they are all typecast. Sisters, don’t fall into that trap. Don’t let your opinions be shaped for you. Know the truth. Don’t be blind to the fact that blacks are being systematically exterminated, and always have been. That there is an irrational fear of one race that pervades our society. Don’t be blind to the fact that the legal and law enforcement systems in our country have unfairly targeted the disenfranchised minorities for decades, even centuries. Know the truth. See the truth. Be part of the change. Don’t be blind to the fact that innocent, hardworking, well-meaning police officers have been unjustly slaughtered as vengeance for the menacing few. Don’t be blind to the officers’ fears that someday someone will unfairly target them only because of the uniform they wear. Know the truth. See the truth. Be part of the change. Do you know what else is a reality? It’s a reality that there is hope. All is not lost. It’s a reality that we are a sisterhood, and that ALL women find unity within our space. All women can feel supported and loved here. This is our safe place. Use this sisterhood to have these brave conversations. Use it to find solutions. We are so strong together. Our Black lives and White lives, Asian lives and Latina lives; our LGBTQ lives, our Muslims lives – all of us have a place here. We all matter. It’s just that our black sisters need an extra embrace these days; an extra show of support. So too, do the police officers in our midst. Someday, it’ll be someone else’s turn. Please… let’s be there for them. This is our truth. This is our unity. Previous article The Official Race Day Missions!